we've all seen and heard about the devastation the Typhoon Reming (Durian) had caused the province of Albay... its been three months since it hit us and the cities all around have managed to struggle back up on its businesses and such. in a way, the place is moving on. still, hundreds of families are inside evacuation centers up to now. worried about their future. not knowing where to live and how when all their houses are washed away or burried deep. yup... digging up a house is no joke. although the filipinos are known to make the worst into the best lessons learned and can laugh about things as tragic as this. the pain that it caused brings unhealed wounds in most families. especially those that we're never found. the problem still lies heavy on those that survived and needs all the help they can get to start anew. a sad fate that we all should think about. we are all lucky. but we should always learn to be grateful that we're still alive, and the little blessings that we receive every damn day of our lives should be taken greatly in consideration. the Cagsawa Ruins stand tall and proud. somehow the flash flood and mudflow avoided passing the same path when the ruins was buried decades ago. but would you believe that surrounding it, houses we're burried and is still there with only the roofs seen...? imagine if it was once yours. the pictures above were taken by me just recently to give you an overview of how the houses are, three months and onwards. if you can see the gray part from the mouth of Mt. 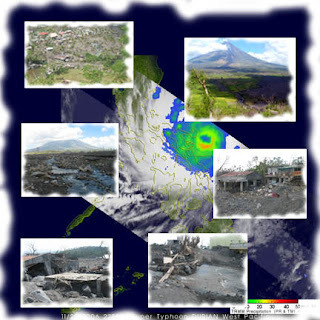 Mayon downwards, that's where the flow began and that's the path that caused all these damages in the province. let us all keep praying for all the families here in Albay. many more are in need of all the help that they can get. i'll be giving more updates soon. for now, let us contemplate and continue reaching out to those in need. Awww... I didn't actually felt REMING! But unfortunately, it was the people from Bicol who were very much affected. buti ka pa d mo ramdam... kami... bumabangon palang... and believe me, nakakaloka first few days after the storm. What the world is coming into? !